In producing the images and selecting the original illustrator files I had had in mind a narrative of an ‘anonymous’ individual seeking hard to find their identity in a crowded and competitive world where advertisements are always trying to make people feel inadequate in order to buy products. Those who are not able to cope with these pressures are given very little help, and often descend into serious mental health problems. My images are informed by novels about experiences in mental health institutions like Janet Came’s ‘Faces in the Water’, also the experiences of people I know, and my own experiences of depression. The brief was to be very open and exploratory, going with the flow and ‘happy accidents’ in order to maximise creativity and discovery. Rather than following a strict linear sequence. My linking thread was an exploration of the theme of ‘identity’ – and the brief by the end to produce of about 12 or more printed images that could form some sort of narrative sequence and be bound together as an experimental book of about 16 pages. Printed as a Concertina on Everyday Photo Paper as my first mockup. I quite like this version – but maybe it could be printed even smaller. Possibly as a series of squares like a comic strip, or with see through windows like the Pacovska. With a bit more editing and thinking about colours. I do not think this would work so well with the text on the backing, so I need to think about something more inventive with the binding. I need to think particularly about the title page. This works better I think at this size and format, ant with backing text. But I need to think more about what types of papers I will print it on. And how to do the text. I also need to redo some of the images in Photoshop so that the jpgs have the right blending. Again I need to rethink the title page. 6/7 Vortex. In the left image I need to use Photoshop to blend in the insect top left. 12/13 Crazy – is the diving figure top left prominent enough? Project 4.1: Papers: broadened significantly my concept of book design and the many possibilities for one single image, thinking about emotional associations as well as technical considerations of paper qualities. And exploring more papers I had not looked at in other OCA courses. Project 4.2 : Creating Images : here I found it was very interesting to really narrow down my options to Illustrator, and black and white exploration of styles. Although this meant that in many ways technique preceded meaning, I discovered new themes and potential meanings in the quite random process of image experimentation. Project 4.3: Printing I focused on Inkjet printing because this was I type of printing I had so far mostly taken for granted and had not really explored all the possibilities of using different types of paper, mediums, overprinting and so on. Other types of printmaking I had done in my OCA printmaking course, and also incorporate in the Assignment piece. I produced a sketchbook of images on the papers I had collected. 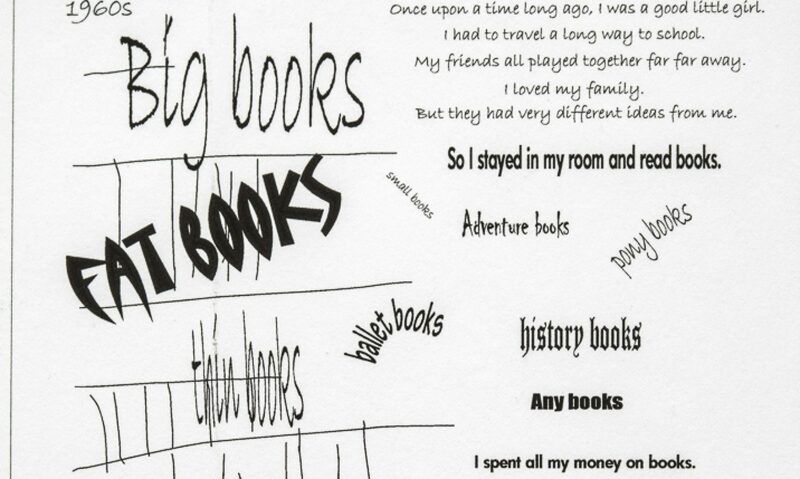 This led to many ‘Happy Accidents’ and discoveries, for example with OHP Transparencies as well as overprinting text. Project 4.4: Collating and binding I looked at different combinations and narratives using InDesign but going back and forth between printing, selection, collation. BUT my design process was not at all linear. It was more useful to see the projects as parallel aspects between which I moved as questions from one level raised questions or possibilities in another. My selection and trial of papers was (and is) ongoing as I think more about what effects I am trying to have, and also discover more about different ways of printing – for example the Happy Accidents with OHP transparencies led to me trying similar types of smearing on other glossy types of paper. Different papers were added to my experimentation as I went along. Binding and collating involved questions of narrative and the relationship between images, which again led me back to the images themselves in terms of both colour and stylistic consistency as a sequence, whether or not different types of paper should be used for different images and types of overprinting. Throughout the process to avoid just getting lost in ‘accidents’ I needed to keep asking myself – what am I trying to say with all this? come to the conclusion that is it better to just go with the flow of life and enjoy it? show a brave anonymous individual being made to feel they have to ‘be cool’ and explore their individuality? is their self-exploration just amusing? or does it lead to disintegration and loss of sense of self? do they then reach any happy ending? or just a compromise? But my understanding and narrative through some of these issues also evolved from the technical and design discoveries, not from pre-planning, and I think this external and somewhat random input helped the narrative from becoming too navel-gazing and enabled a bit of humour. I am sure that after a break from this and further work on other things I will come back to this with some more inventive ideas, not only on the title/concept, images and printing but particularly on the overall concept and design/binding. I like quite a lot of the images, find the narrative quite poignant, but I do not feel it is yet innovative enough.